Some experiments are doomed to failure. Take today’s Cherokee for the example. The crossover is a pretty good vehicle, but it isn’t too popular these days. Can you find the reason for that? Well, we think we know? 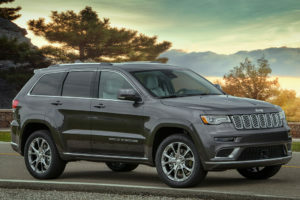 The carmaker introduced the vehicle back in 2014 and decided to use the “Cherokee” nameplate, which is a synonym for a true SUV with accentuated off-road abilities. Now, the main problem isn’t the not-so-good off-road kit of the current Cherokee. No, it’s more the unconventional exterior design, which doesn’t resemble the bigger brother at all. 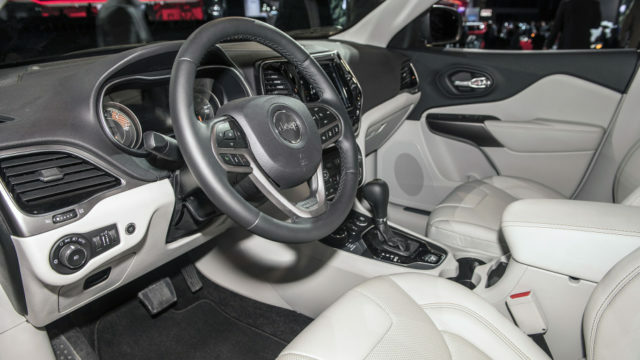 The manufacturer can fix this with the updated 2019 Jeep Cherokee. The crossover has been introduced today at the 2018 Detroit Auto Show and judging by the first impressions, it may be a far better option from the predecessor, not only because of the new engine but thanks to a new heart under the hood, which will definitely inject more blood into the veins. The starting option will continue to be a 2.4-liter four-cylinder engine. The manufacturer didn’t change anything here, so you can expect the same old unit with 180 horsepower and 170 pound-feet. It’s pretty much the same story with the 3.2-liter V6 because it kept its 271 horsepower and 239 lb-ft of torque. The new-in-house unit is a 2.0-liter, turbocharged four-cylinder mill, which delivers 270 horsepower and 295 pound-feet of twist. Even though it delivers just a pony less from the V6 and significantly more torque, the new turbo unit isn’t going to be the towing leader. No, the first place stays reserved for the 3.2-liter model, which will be able to tow up to 4,500 pounds. Basically, this is the class-leading result. On the other hand, the new turbo unit will definitely provide a far better fuel economy result. The carmaker hasn’t released the official numbers yet, but taking into account brand new technologies, including stop/start system, it has to be the best option. No matter which engine you choose, you will get a standard nine-speed automatic transmission. The new powertrain isn’t all regarding the fuel saving. 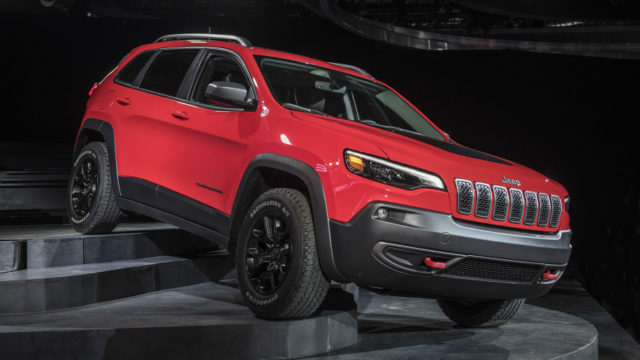 Although it’s basically just updated model, the 2019 Cherokee managed to lose some weight thanks to some aluminum. The vehicle features an all-aluminum hood, while the tailgate sports some composite materials. Lightweight materials are in the pistons and camshaft as well, though the carmaker didn’t say how many pounds the crossover managed to shed. Unofficially, the new vehicle is around 200 pounds lighter, which is not bad at all. The majority of styling changes are in the front. The SUV hosts a new nose and with a handsome seven-slot grille. Jeep has added a pair of more attractive headlights, which feature more traditional look. LED technology is standard across the range. 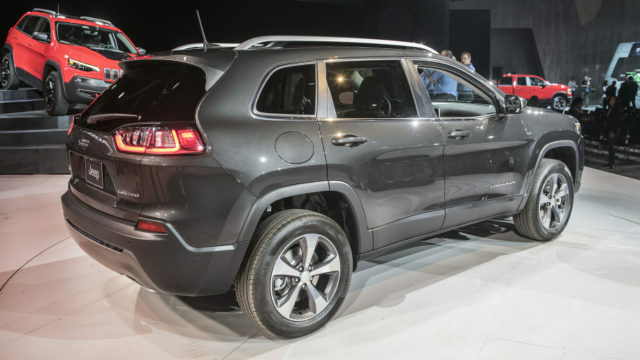 Around back, the 2019 Jeep Cherokee gets new taillights and redesigned tailgate, as well as a new position for the license plate. The off-road Trailhawk model hosts some special changes. The SUV has special and better approach and departure angles, as well as an inch higher suspension. The cool version uses unique wheels and totally functional tow hooks, while the standard chrome trim has been replaced with a more attractive blacked-out treatment. 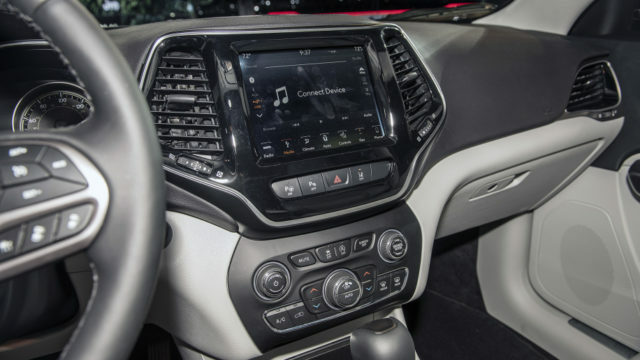 Inside of the cabin, the crossover is featuring new air vents and new infotainment touchscreens (7- or 8.4-inch) with standard Apple CarPlay/Android Auto connectivity. There’s one more USB, while the cargo space has increased from 24.6 to 28.0 cubic feet. 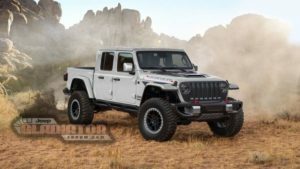 Jeep hasn’t released any pricing information so far. Still, according to the latest reports, the SUV will cost around $26K. The 2019 Cherokee will hit the dealerships this spring.